Showy China Asters are stitched with dimensional flower petals that are self-supporting because of the new shadow drizzle. Bullion rings, cast-on bullions, and the new extended cast-on are part of this design, as are new leaf techniques. “Applesauce,” is a little orange kitten, sleeping beneath a canopy of garden flowers, nestled on a pillow of ferns (of course!). The Copycat Cast-on border is echoed below dimensional ferns. 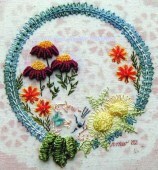 Two different weaving techniques, the ridged blanket stitch and reverse fly stitch are also used in this Brazilian dimensional embroidery design that includes painted daisies, pincushion flowers and marigolds. 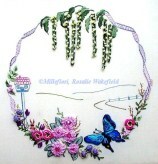 A stitch guide and finishing suggestions are included with all Millefiori designs. 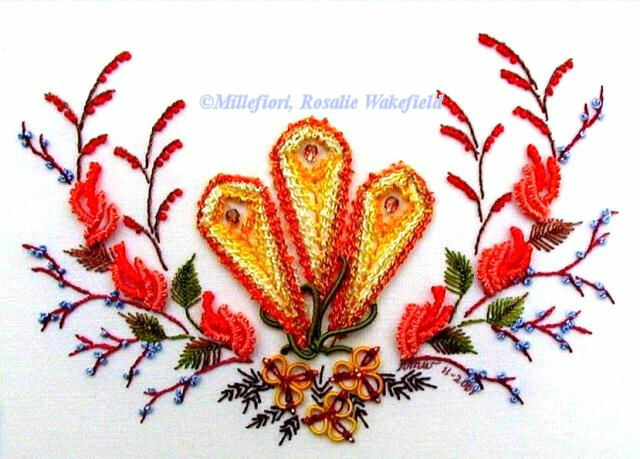 This is an intermediate-level Brazilian embroidery design. Far beneath the ocean, in an underwater cave, wondrous forms of life flourish, and glorious wondersea flowers delight the adventuring stitcher. 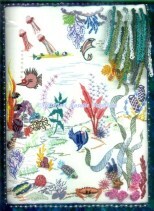 Jeweltone fish and gemstone flowers delight the creative needle artist. Enjoying their deep-sea domain are Otto Ott Lightfish, the fierce Lionfish, Spokesfish, a Needlefish, Lunching Fish, Will & Bill and Spot & Dot, a Parrotfish, jellyfish, a crab, clams, urchins, starfish and an assortment of sponges, rocks and ferns. Some of the stitches used are Stretch, Twist ‘n Tack, Carrot Feathers, Satin Stitch, Blanket Stitch, Running Cast-on Stitch, Brazilian Outline Stitch, Barbed Bullion, Detached Buttonhole Bullion, B.O.B. This design is available in .pdf file format only with full-color instructions and a traceable pattern for transferring to your choice of fabric. A stitch guide and finishing suggestions are included with all Millefiori designs. 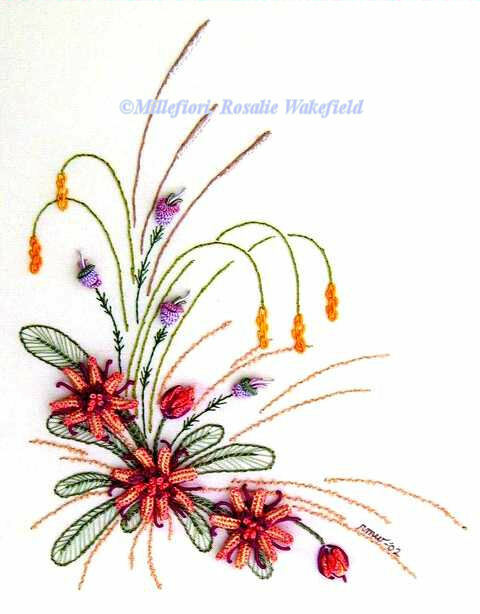 This is an intermediate-advanced level Brazilian embroidery design. Design: 8 ½” x 11”. Traceable pattern and instructons. Retail only. PDF will be emailed upon receipt of payment. This delicious little design will satisfy the Brazilian embroidery sweet tooth in any stitcher. A milk-glass candy dish, realistically stitched with the up-down corded buttonhole stitch, is filled with Sweet Treats – gummy bears, red hots, lemon drops, popsicles, mints, peppermint sticks, candytuft, a bubblegum bush, a lollipop tree, a jellybean tree, and lots of cotton candy. This is an advanced-level Brazilian dimensional embroidery design with several challenging new techniques – the double-crossed drizzle, up-down corded buttonhole stitch, criss-cross satin stitch, up-down double cast-on drizzle, a ‘dynamite’ stitch called T’nT, and the pre-constructed stitches “Slim” and “S.A.M.” Instructions for making your own “Jelly Bean” floss are included. For serious foodies, take a look at Millefiori design #962 “Gingerbread House”, another no-calorie candy treat in a frame. 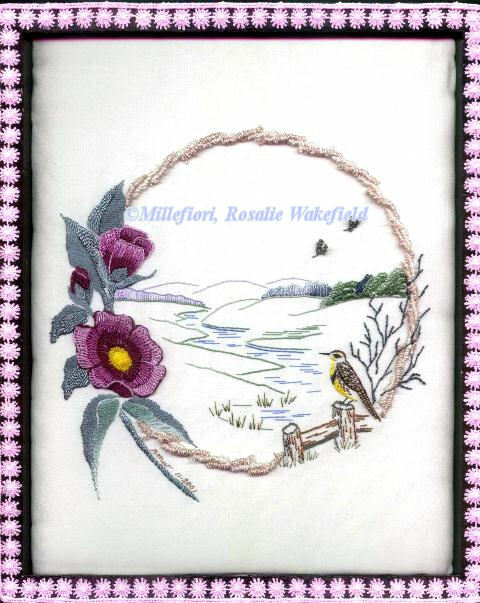 This Brazilian dimensional embroidery design provides a lesson in creating dimension through color placement, as well as realistic landscape shading. 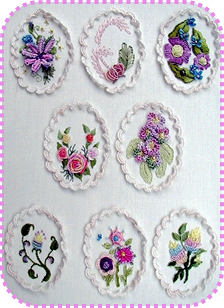 Stitches include the raised buttonhole stitch, briar border, barbed bullion, drizzlebirds and long and short satin stitch. 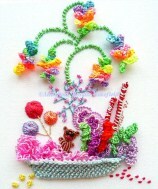 A stitch guide and finishing suggestions are included with all Millefiori designs. Level: intermediate-advanced. Beautiful Blue, a dimensional butterfly stitched entirely with Brazilian dimensional embroidery techniques, provides a visual pathway into this peaceful prairie garden. Also lighting up the scene are Banks Roses, the Golden Glory Vine, Figure 8 Flower, Prairie Flower, and Penny Flower, plus a little funny bunny and a birdhouse. Some stitches used are blanket stitch, Brazilian outline stitch, Millefiori's original enhanced drizzle, running cast-on, up-down cast-on, double cast-on, ridged blanket stitch, long-tailed bullion, Millefiori’s original knotted turkey stitch (an easier version of traditional turkey work) and one-step leaf and stem. This wonderful classroom teaching project includes a stitch guide and finishing suggestions. This design is suitable for framing an announcement. 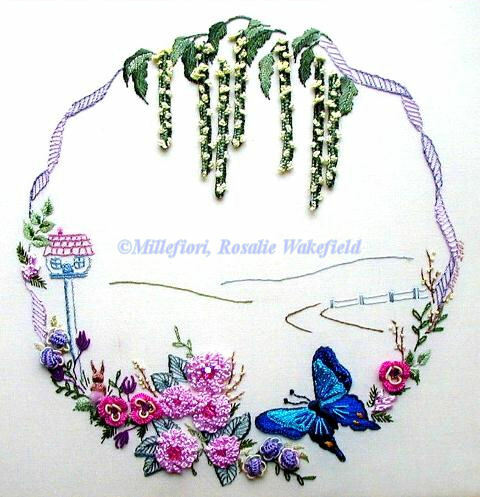 Seasons change depending on the choice of colors used to stitch this Brazilian dimensional embroidery design. The Autumn Rose, Calypso (a calendula), and Button Ferns encircle the central Candleflowers, which are stitched with two shades of Bouclé. Fly stitch and reverse fly stitch variations for leaves and flowers are included, as well as the cast-on bullion and Charisma knot. This Millefiori design offers lots of stitch possibilities – rayon thread embroidery only, or beadwork, metallic thread embroidery, goldwork, Romanian Point or needle lace, or appliqué. 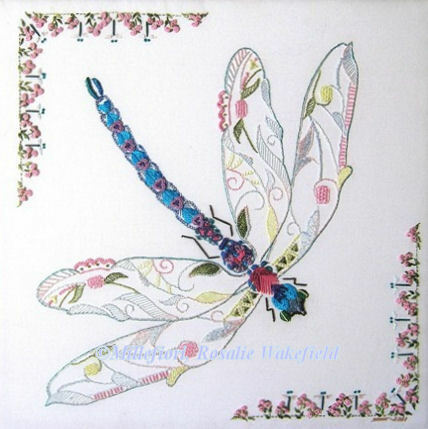 Each corner floral design features Niblet Flowers and delightful little Dragonflowers. Brazilian couching is introduced in this design, which is suitable for a pillow, framing, or finishing into a small art quilt. A stitch guide and finishing suggestions are included with all Millefiori designs. 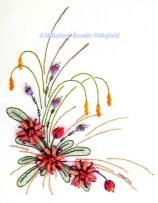 This is an intermediate-advanced level Brazilian dimensional embroidery design. All instructions, photograph and a fabric print are included with this bell pull design that introduces seven oval designs with flowers from the book, My LadyFlowers, by Rosalie Wakefield. A stitch guide and finishing suggestions are included with all Millefiori designs. 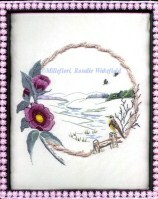 This advanced-level Brazilian embroidery design is ideal framed for a narrow wall in your home. All instructions are included with this delightful design that introduces nine new flowers and floral combinations from the book, My LadyFlowers, by Rosalie Wakefield. 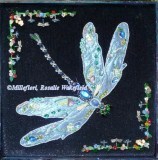 A stitch guide and finishing suggestions are included with all Millefiori designs. This is an advanced level Brazilian embroidery design.